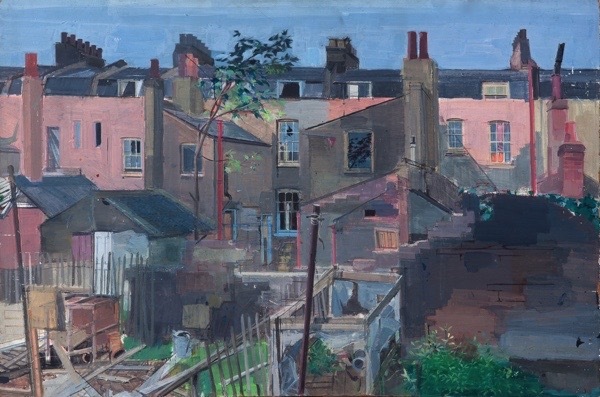 One of the great joys of compiling my new book East End Vernacular, artists who painted London’s East End streets in the 20th century to be published in October, has been the discovery of forgotten paintings and painters – thanks to suggestions sent in by you, the readers of Spitalfields Life. Yet perhaps the most spectacular discovery of all has been the paintings of Peri Parkes (1952-2009) which had entirely slipped from the public eye, and of which I am delighted to publish a selection for the very first time here today. 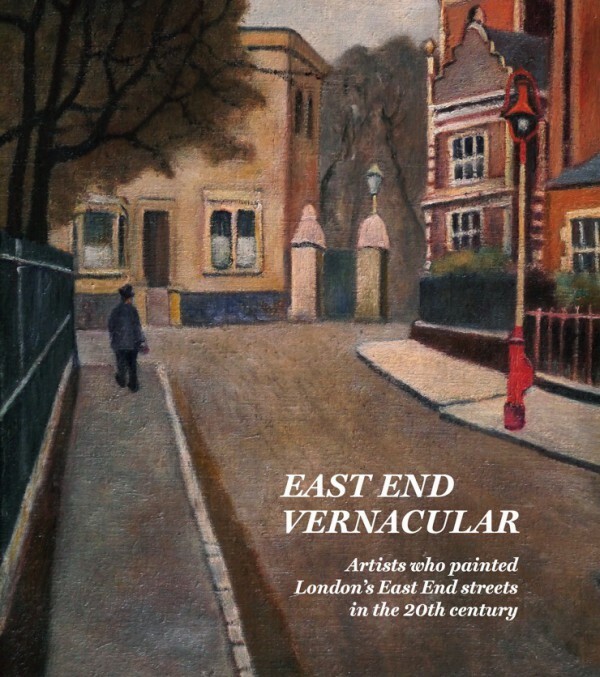 Thanks to your generous support, we have now almost raised enough money to publish East End Vernacular and we only need a couple more investors. Click here for more information about how you can help. 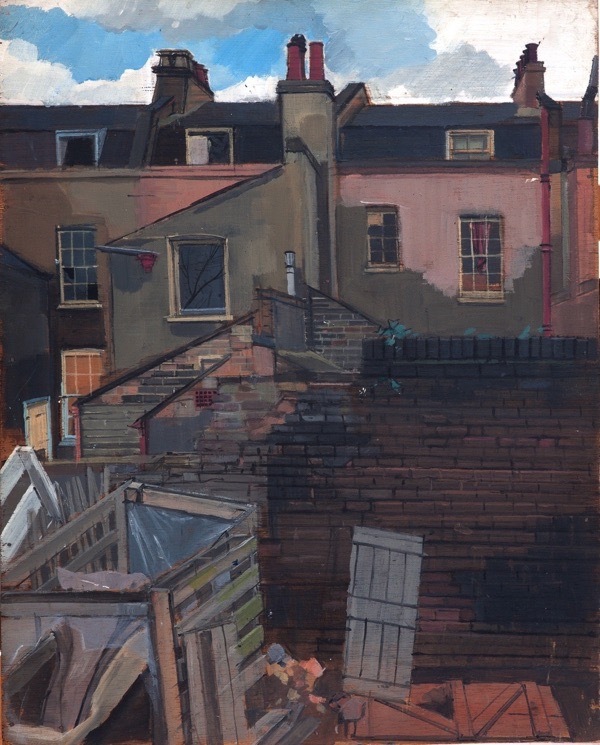 Just over a week ago, the artist Doreen Fletcher, who is celebrated for her paintings of the East End which were first seen in theses pages wrote to me about Peri Parkes. On Doreen’s recommendation, I took the train to Hertford last weekend to meet Peri’s daughters, Lucie & Zoe who showed me fifty of their father’s paintings which have been mostly stored in a cupboard since he died in 2009. The quality and significance of this work was immediately apparent and I knew at once that I must devote a chapter in East End Vernacular to celebrate the rare talent and rigorous vision of Peri Parkes. Out of the tragedy of a broken relationship, Peri Parkes created a transcendent series of paintings and it is impossible not to touched by the self portraits that he included in his work, of the lonely man walking in the park or climbing onto his bike. Today, Lucie & Zoe are the custodians of this legacy and they spoke affectionately to me about their father as we sat surrounded by his wonderful paintings. Zoe – My father was from Hampstead Garden Suburb in Finchley. He had a Greek mother – who named him Pericles, she came from quite a well-to-do family and his father was a solicitor. Dad was born and grew up there but he left home very young, about sixteen. Then he met Lindsey, my mum, and they had me when he was just eighteen. My grandmother bought a house in Ridge Rd Crouch End and we all lived there. Lucie - When he was nineteen, he got a scholarship to the Slade. I should add that when he was sixteen, he went off to Afghanistan, back-packing. He and mum first met at the railway station, just before he was about to leave and there was obviously a spark. Once he came back, they met up again and married when he was eighteen and mum was seventeen. Zoe - When I was a baby, he used to take me off to college with him. He put me on his back and off we would go to the Slade. Lucie - Mum had agoraphobia after she had Zoe, so he had to take her with him – a nineteen-year-old with his baby. Zoe – They split up when I was six and Lucie was three, around 1979. He went to stay with his friend Martin Ives in a prefab in Condor St, Stepney and we stayed with our mum in her mum’s house. After that he got a housing association flat next to Bow Rd Station and then he moved just around the corner to Mornington Grove. 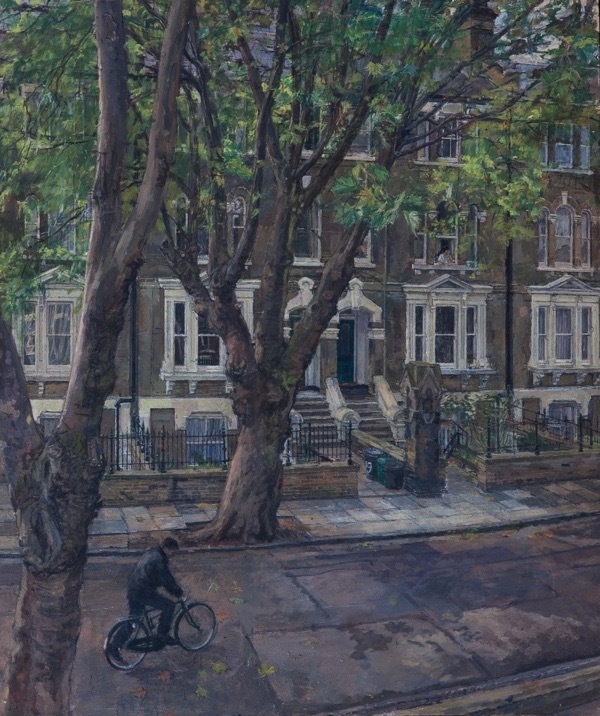 Lucie – He never had a studio, he just painted in the flat where he lived. He was completely unmaterialistic and his whole flat was his studio with bare floors, bare walls, furniture that he picked up from skips or off the street, boxes and then piles and piles of paints. All over the furniture there was paint splatters and full ashtrays. He did not really ever think about comfort. Zoe – He was so driven by painting. He had a one track mind. He did not really want anything else in life but to be able to paint and to go to the pub. Lucie – We used to go and stay with him every other weekend in the prefabs and hang around in the back yard, I remember doing snail races and counting slugs while he painted. Zoe – He took us round galleries quite a lot, which as children was quite boring to us – but he used to get very enthusiastic about things he wanted to see. Lucie – To say he was very self-absorbed is only half the picture because he was not egotistical, he was actually quite a humble person, and a loving and affectionate dad. I remember lying in bed in the prefabs when it was freezing cold and he used to tell us stories, and they were brilliant. We loved him and loved being with him, but he was not really able to give to his relationships because everything was about painting. Zoe – I think he struggled with depression a lot, whether it was to do rejection as an artist or with not getting things right. He was a real perfectionist and he had massive temper flare ups if he was not satisfied with his work. Yet he had a real community in London. He used to go to the Coborn Arms every night and he had a crew of friends there. Lucie – Nothing he did was ever right or good enough for him. He was always striving to be better. He could not give his paintings away let alone sell them but, if he did give one away to a family member, he took it back because it was not quite good enough. If he was here now, he would be looking at his paintings, very dissatisfied, and he would want to make changes. He was driven to paint what he saw in front of him. 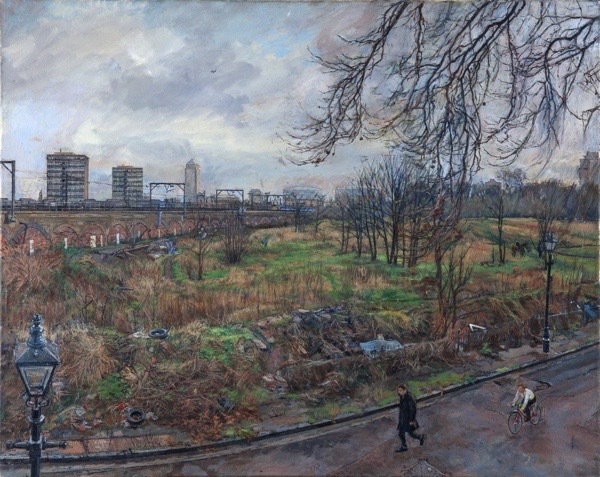 I do not think he was driven to tell the story of the East End, it was just that, wherever he was, he painted obsessively to capture what he was seeing. Most of them are from his window in his living room or the back of his prefab. Zoe – He was always submitting pictures for exhibitions and competitions, and he took the rejection quite personally. Lucie - When his relationship broke down with mum he was deeply hurt. I think the more things went wrong in his life, the more he channelled everything into painting. I can remember him taking us home on the tube once and him looking at us and tears pouring down his face. That sticks with me because I knew then that he really cared and was hurt by the whole thing, but he could not express any of that – it all went into his painting. 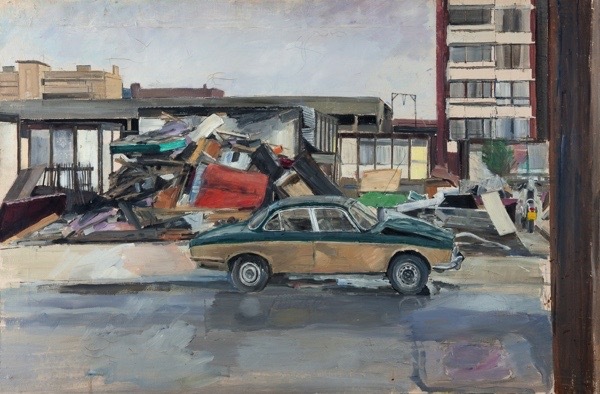 Zoe – I look at these paintings and I see them as dad’s life at the time, from the time arrived in the East End in 1977 until he left in 1992. The style at the beginning is quite different from the later ones. He went on holiday to the tiny town of St Just on the farmost westerly point of Cornwall and fell in love with it. The day after returning from holiday he saw a job for a part time art teacher there in the newspaper, it was like an act of fate. 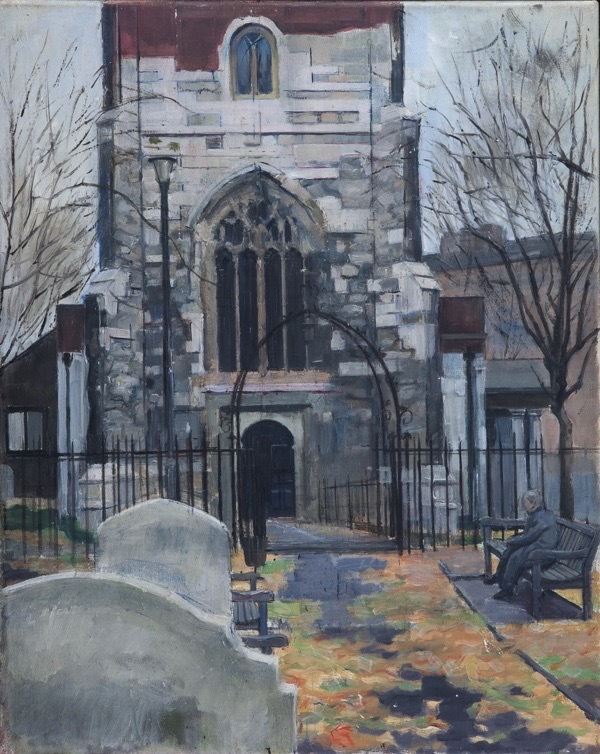 He had taught Art at the Blessed John Roche School in Poplar and he wanted out of London. He loved it in Cornwall and lived in the most remote place. He said Cornwall was as close as he could get to Greece in this country. Bonnard before he moved to the Mediterranean littoral, Vuillard after he became a society painter — the palettes, not the themes. Thank you. These are amazing: full of realism but very painterly and full of artistry. I am walking along that street; staring down on the dinner ladies from my high rise flat; looking out from the window of St. Bernard’s School. How ridiculous that the work of this man should have been ignored. 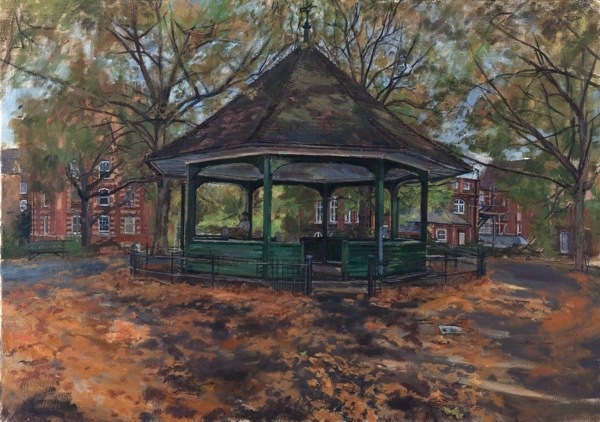 What wonderful work you are doing GA, reclaiming that which has been overlooked, undervalued, forgotten and to Doreen for remembering her old friend and his talent. These have made my day. What an extraordinary find. I’m sure I know of a ‘regular’ in the Coborn Arms who must have known Peri. Thank goodness he’s going to be in the book! The more I see of the painters who are going to be in your book the more I get the sense that they were stigmitised by the art world because of their style AND living in the East End. 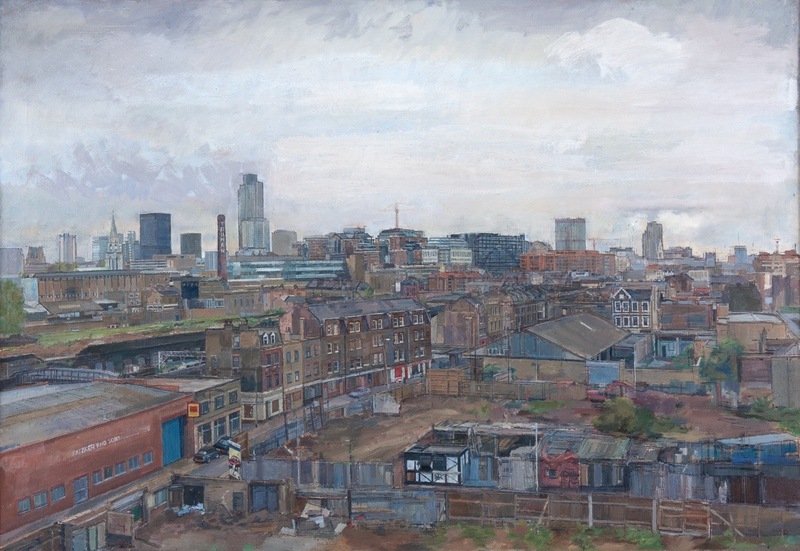 Peri Parkes’s work really is outstanding, and I think you must include some examples in ‘East End Vernacular’. 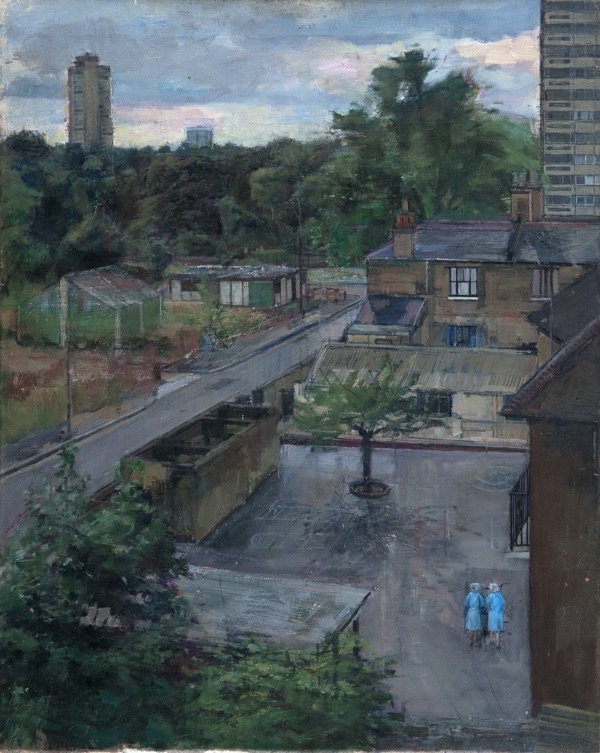 I think the book will turn out to be absolutely invaluable for recording the work of many unjustifiably neglected artists, and show many dimensions of this fascinating part of London. Art is a subject upon which my knowledge is limited but when I see paintings like these which are so detailed and accurate as to look like photographs I would say that this is the work of a very great artist. GA, thanks for yet another great story and set of paintings saved from obscurity. Luci and Zoe must be thrilled to have their father’s story told and preserved in EAST END VERNACULAR. What an incredible talent you’ve unearthed. He so deserves to be included in your book. Good luck on its publication! multiple additions of East End Vernacular as more and more discoveries are made. many other artists will be rescued from oblivion. This body of work by Peri Parkes is breath-taking. I am curious about the size/dimensions of these paintings? The Departure! Just stunning. Thanks for bringing him to our attention. These artworks are masterfully structured with the eye of a trained architect and the heart of an impressionist. What a fantastic discovery you made here Gentle Author! It’s a shame Peri did not enjoy major exhibition during his rather troubled life, but your publication will go some way to providing remedy and pleasure to those who appreciate real artists! Thank you so much for this. What a pity he couldn’t realize what a talented artist he was – that the grim eye of self-judgment was always upon him. These paintings are wonderful – just the type I would love to have in my home. At last, at last! Peri’s work gets the attention it deserves – would that he had lived to see it! 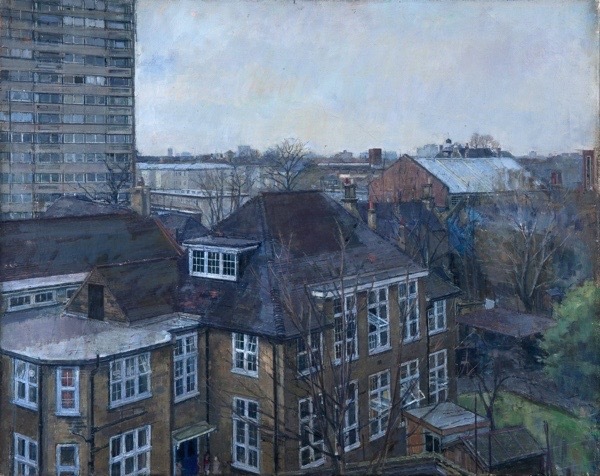 He was our friend and neighbour in Mornington Grove, and we have picture of his that we actually persuaded him to sell to us – another picture of Bow Triangle, the view south from his window. I’d meet him regularly in the Coburn Arms – we’d talk art, politics and music. He was one of the kindest, quietist, most gentle of characters you could ever meet, and a great artist. Is there any chance now of a retrospective? An exhibition at the Whitechapel or Bow Nunnery? I think I worked with Peri at Queens Crescent play centre in Kentish Town in about 1978/9. Very sorry to hear about his early death. Wonderful paintings.